When we last reported on Sawgrass, Apopka, and Wilson in February, they were still in Brazil. A five week lag in data delivery as they traveled through the remote Amazon region of Brazil and Colombia’s Andes Mountains left us anxious for news until 17 March, when their data stream resumed. 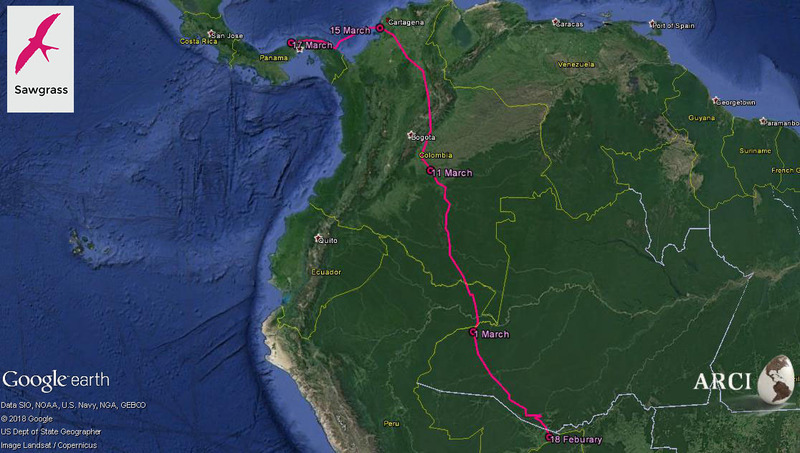 We were relieved to learn that Wilson was safely in Nicaragua, Sawgrass in Panama, and Apopka in northern Colombia. The transmitters store each kite’s movement data while the birds are beyond range of cell-phone towers, then download the backlogged locations once their signals are detected. After fueling up one last time in early March on the border of Brazil and Peru, Wilson passed from Peru to Colombia. He made short work of the Andes Mountains in Colombia, crossing in just 30 hours. 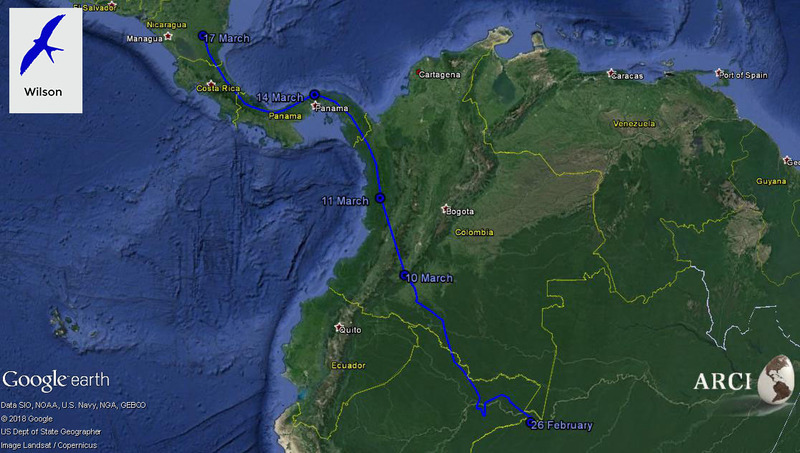 On 12 March, he quickly navigated through Central America, cruising through Panama in three days and Costa Rica in one. When Wilson came back online on 17 March, he was near the small town of San Ignacio in Nicaragua. Sawgrass reached the State of Acre in western Brazil by 18 February, and by 1 March had left Brazil behind for Peru and Colombia. Our tagged Swallow-tailed Kites usually cross the Andes Mountains many miles south of Bogota, Colombia. 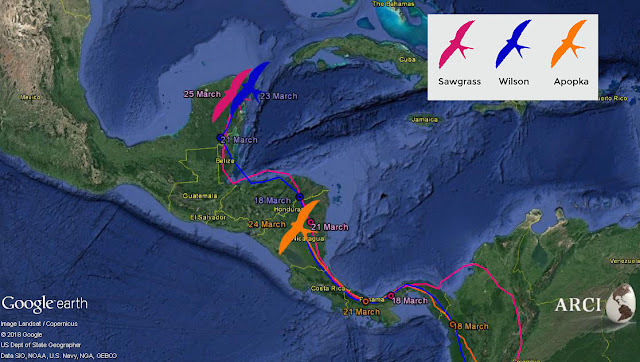 Perhaps due to the winds on 11 March, Sawgrass chose instead to remain east of the Andes as she flew northward, eventually entering the mountains east of Bogota as she traversed the Andes on a north-northwesterly heading all the way to the Caribbean coast at Cartagena, Colombia. By 17 March, Sawgrass was halfway through Panama. By early February, Apopka was in the state of Rondonia in western Brazil. He made her way out of Brazil by the end of the month, crossing through Peru and into Colombia in early March. Apopka reached the foothills of the Andes by 15 March, then crossed these imposing mountains in 2 days, settling onto the Pacific coastal plain by the 17th. Since then, we have received regular data from all three kites. Wilson crossed into Honduras on 18 March and took a well-used short cut over the Gulf of Honduras to bypass Guatemala. By 23 March, he was perched near the coast of the northeastern Yucatan Peninsula, about to cross the Gulf of Mexico. Sawgrass stopped very little after leaving Colombia, passing through Panama in three days. She then covered Costa Rica in one day, zipped through Nicaragua on 21 March, and reached the Yucatan Peninsula by 25 March. After reaching central Panama, Apopka’s route was nearly identical to that of Sawgrass and Wilson. He toured Costa Rica and was in Nicaragua on 24 March, when he last checked in.